I randomly picked up this book at the thrift store and I'm so glad I did. I really enjoyed how to story was told through a series of one sided letters and I thought the characters were great. I don't think there was one character that I truly disliked. It was a great book, I have another one by this author called My Sister Lives on the Mantelpiece that I plan to read soon. 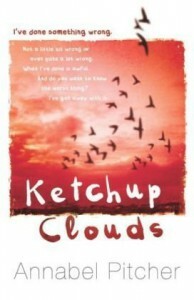 Hopefully I like it as well as I liked Ketchup Clouds.